What is the best consequence to use for a particular behavior? This is probably the most common question we receive during our online parent coaching sessions. Parents wonder which consequences to use, how to set them up effectively, and how long to give them. A great way to start figuring out the right consequences for your situation is to sit down during a calm moment and create a list, or “menu,” of consequences and rewards for your child. Each behavior you are worried about should have a specific consequence. And the best part? You can even have your child help you create the menu. To help you get started, we created a set of example consequence menus for kids ages 5-9, 10-14, and 15-17. These menus are grouped by age and developmental level so they will be most effective with your children, no matter what stage they’re in. Included in the menus are some of the most common suggestions that we give to parents. Our suggestions are based on what we find usually motivates children and teens in that age range. At any rate, you know your child best. And you will know what motivates her. If you know that your child doesn’t care about electronics, for example, feel free to use something else instead. It can actually be helpful to sit down with your kids and ask them what they would like to work toward for a reward, for example. What this means, in the simplest form, is that if you take something away, your child should know what specific behavior he or she needs to show over a specified short-term period of time in order to earn it back. Let’s say your teen daughter is verbally abusive to you. As a consequence, you decide to keep her cell phone until she can go for two hours without swearing or calling anyone a name. During that time, she will be practicing the desired behavior (i.e., no swearing and no name-calling). Your child is then rewarded when she is able to carry it through for the entire two hours. If she can’t, the two hours start again from the time she misbehaves. 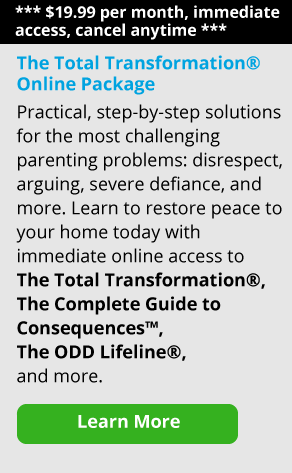 Remember, as James and Janet Lehman, creators of The Total Transformation® parenting program, tell us, the goal here is to teach your kids what to do differently next time. If you simply ground them or take something away for long periods of time, you’re simply teaching them how to “do time,” which is not the goal. In general, we do not recommend withholding a privilege for more than three days. After 3 days, the privilege can start losing its motivational power. The exception would be if there was a safety issue involved. For example, if your teen was driving under the influence then the consequence would be significantly more severe. We recommend picking one consequence or incentive to go with the behavior you are focusing on. Ideally, you will have had a chance to let your child know ahead of time what that consequence or reward will be. In this way, your child knows exactly what he or she will lose or gain as a result of the choices they make. Sometimes when parents are in the middle of a heated power struggle with their child, they feel tempted to give multiple consequences for the same behavior to “make” their child comply. But this is almost always ineffective. We call this “consequence stacking,” and it should be avoided. Here’s an example. Let’s say your child swears at you and you say, “That’s it—you’ve lost your phone.” Your child, of course, talks back defiantly and you reply, “Okay, for talking back, now you’ve lost television, too!” Or maybe, “No video games for a week. Now it’s for two weeks! Three! Nice going, you’ve lost them for a month now!” As you get angrier and angrier, the consequences just stack up. And your child, at that moment, doesn’t seem to care. The trouble with consequence stacking is that it ultimately undermines your authority because you are bringing yourself to your child’s emotional level by giving a knee-jerk punishment rather than a well-thought-out consequence. In order to avoid this temptation, we recommend waiting to give consequences until everyone is calm and then picking one thing that will be an effective motivator for your child. 4. Don’t Forget About Problem-Solving! James and Janet Lehman point out that “consequences alone do not change behavior.” If that were the case, you could take away a privilege and your child wouldn’t act out anymore. Instead, it is better problem-solving that helps your child act differently. Indeed, better problem-solving in the future is the key to lasting behavior change. And giving consequences and rewards is a tool you can use to keep your child to his or her word. It takes a child time to learn new behavior patterns. And it will take them time to realize that you are serious about consequences and that you will give them consistently. Therefore, don’t be discouraged if, in the beginning, your child’s behavior does not seem to change. Just let the consequences do their work and give it a little time. Most kids with behavior problems come around when this is structured right. Think about a policeman giving speeding tickets. Just because someone doesn’t slow down after their first ticket doesn’t mean that speeding tickets don’t work. They do work, it just takes some drivers longer than others to learn to slow down. We encourage you to download copies of these consequence menus as needed with your child. We hope that this will be a helpful resource for you as you work on your child’s behavior. Feel free to leave us a comment and let us know how it’s going. And please share any consequence suggestions that worked with your child!